Whether your practice implements developmental screenings or you are interested in beginning to implement developmental screenings, Help Me Grow Yolo County is here to support you. Help Me Grow Yolo County is a free service available for all families with children 0-5 and the individuals working with them. Healthcare Providers have an irreplaceable role when discussing developmental concerns and supporting families in seeking assistance. However, healthcare providers may be pressed for time and unable search for non-medical resources for patients and/or may need additional support for at-risk families in the community. Whatever your situation Help Me Grow is here to help. The American Academy of Pediatrics (AAP) recommends developmental screenings be conducted at a minimum, periodically at 9, 18, and 24 months. This included continuous developmental surveillance, further medical and developmental evaluations if delays identified, and early developmental intervention. Help Me Grow can assist your practice to meet these recommendations. Provide you easy access to a free developmental screening tool online or hard copy. Work with patients who need monitoring between well-baby checks and, with the permission of the client, send you the results. 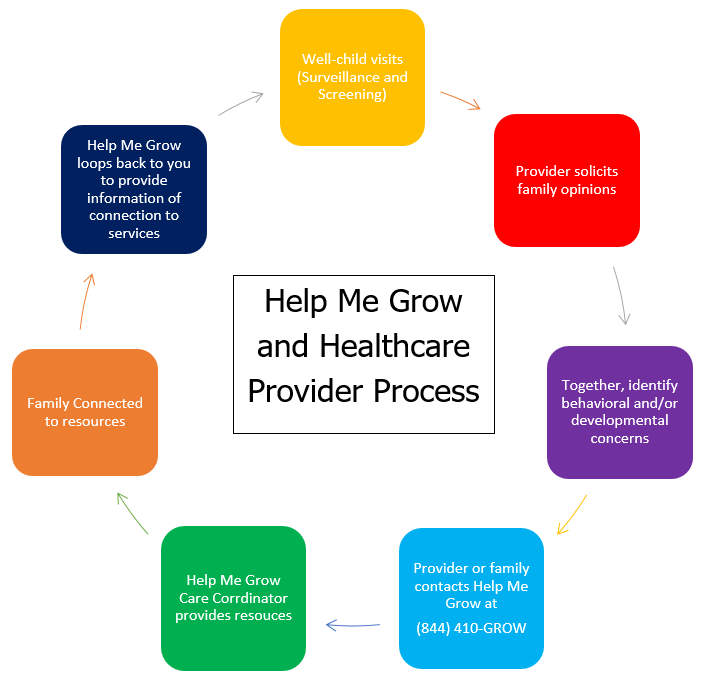 The Help Me Grow process below, created by Help Me Grow National, represent what you can expect when working with us. After we receive a referral form from a healthcare provider, we contact the family, sign them up for developmental screenings, share any resources and help answer any other questions they have. Help Me Grow will follow-up with the family to see if the family was able to utilize the resources and, if necessary, help them find alternative resources they may be looking for. Help Me Grow will notify you, the provider, after we initially contact the family. We’ll let you know if a family signed up, declined services, or if we were unable to contact the family. We’ll also give you an update after we follow-up with the family. In addition, we’ll fax you a copy of the developmental screening summary sheet each time a family completes one, as long as we have permission from the family.